Container Essentials LLC, an independent specialist in sourcing and supplying reusable commercial containers for scrap recycling and industrial customers, has expanded its product lineup with the Big Grizzly Rotator Cart. Chicago, IL, January 22, 2019 – Container Essentials LLC is pleased to announce the introduction of the Big Grizzly Rotator Cart to its extensive lineup of reusable commercial containers. To celebrate, they’re offering special introductory pricing for a limited time. The Big Grizzly Rotator Cart is a 38.25” tall mobile container designed to be lifted and dumped using a rotating forklift. Its steel base won’t warp or absorb moisture, and it supports heavier loads than containers with plywood bases. 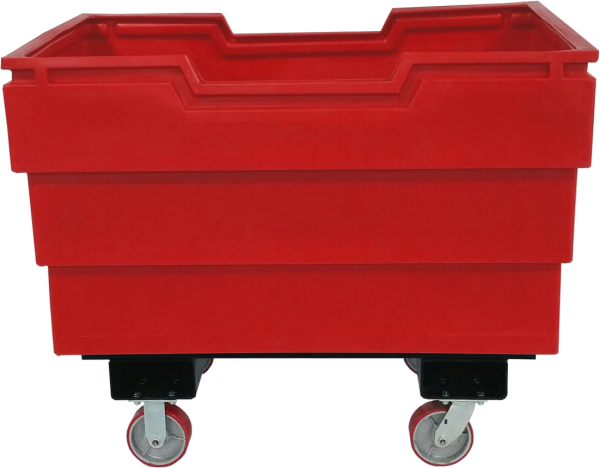 With a capacity of 25 cubic feet, this tough polyethylene cart is perfect for material handling and scrap recycling. Capacity: 186 Gallons, 25 cu. ft.
Caster upgrades and drain holes are available. “We’re excited about the Big Grizzly Rotator Cart. It’s perfect for our industrial recycling customers who need a mobile container that supports heavier loads and is rotatable with a forklift.”, said Steve Phelps of Container Essentials. Full product specifications on the Big Grizzly Rotator Cart, as well as the complete Container Essentials product lineup, can be seen at www.ContainerEssentials.com. Container Essentials LLC, is an independent specialist in sourcing and supplying reusable commercial containers for scrap recycling and industrial customers.